I have gathered some of my favorite activities and projects for May. There are ideas to cover all areas of the curriculum. Many of these ideas can be used throughout the spring and the end of the school year. I hope that you enjoy using them as much as I have over the years. 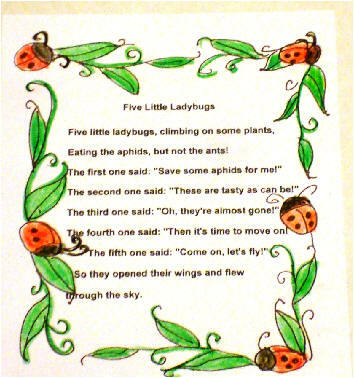 All patterns are included with PDF files that make it very easy to copy and use in your classroom. Detailed directions are also provided with each of the activities shown on this page. The cost for all of the ideas is $15. There is a 10% discount for purchasing two monthly packages--2 for $27. See details at the bottom of the page. 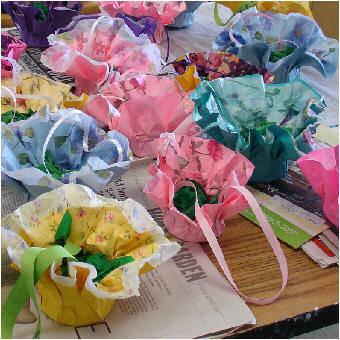 Make fun, May Day baskets! 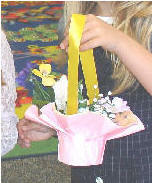 The baskets also are nice for Mother's Day gifts or table centerpieces. So cute! Making a May Calendar is a fun way to practice writing numbers. This is a worksheet that makes assessing sorting skills easy! 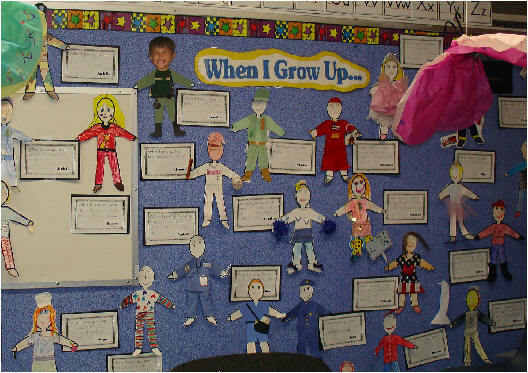 Children sort, cut and glue pictures in place. I apologize for the poor quality of the sample shown above, but the PDF you will receive is clear! A blank grid to practice writing numbers from 1-50. A blank grid to practice writing numbers from 1-100. 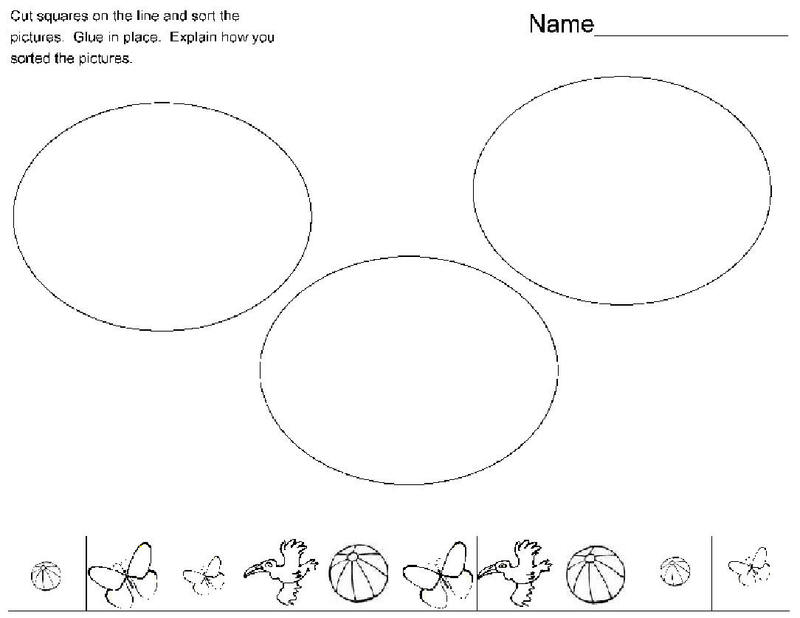 This is a worksheet for testing skills in finishing patterns. Students cut and paste the pieces in place.--- Easy Assessment! These fun little bouquets make great cards or a fun bulletin board to celebrate spring! Patterns and directions given in PDF. Students add a color word to each page to complete a easy, emergent reading book. 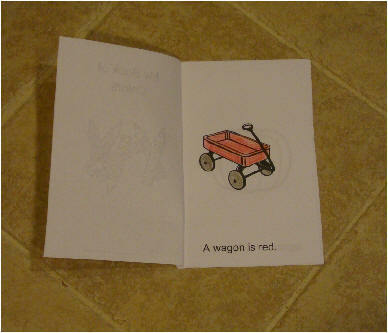 This little book reinforces reading and writing color words. 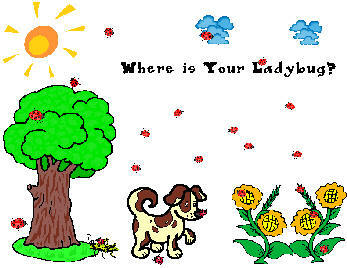 Students finish their own story of where is the ladybug. Book cover and blank writing paper is given to make your own class book. 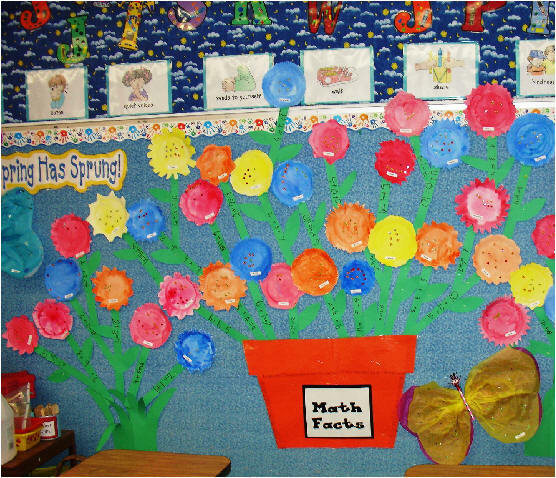 Flowers that help to teach math! Directions, patterns and banner and Math Facts sign are given to make this cute bulletin board in your classroom. 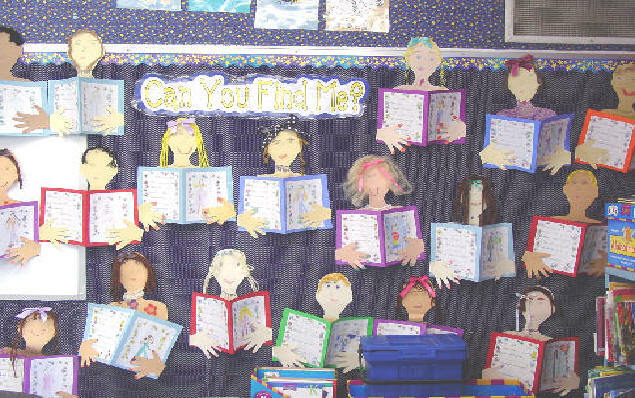 This bulletin board was used for Open House. Parents had fun finding their child with these fun portraits. 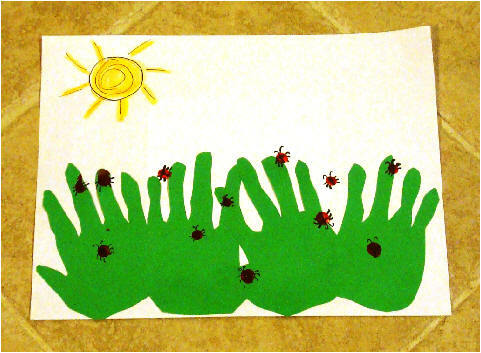 Patterns, directions, and bulletin board banner are given in PDF. 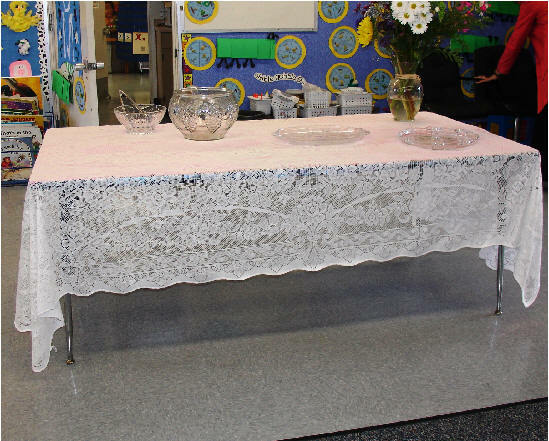 This is a fun, home project for students to complete for Open House. The banner is also provided for you to use. We tie this in with our social studies unit of community workers and careers. 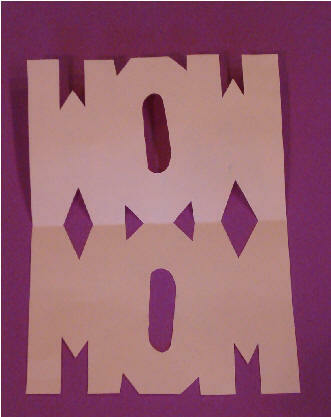 Mother's Day card that says WOW when it is opened! 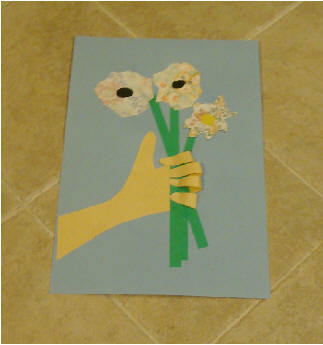 Another idea for a Mother's Day card to say: Happy Mother's Day with flowers! Mom is holding a cute little poem, too! Patterns and directions are given for these fun cards! 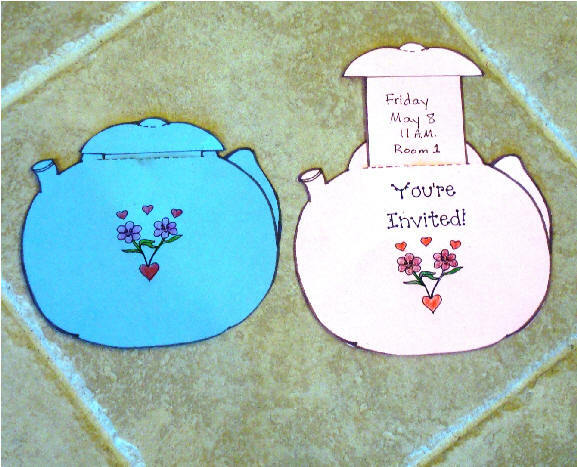 Patterns and directions are given in PDF to make an invitation or a plain card. Two different patterns are provided! Children can write message on the pop-off lid to the teapot. This is a scripted program for a Mother's Day Tea. This has always been a favorite of the moms. 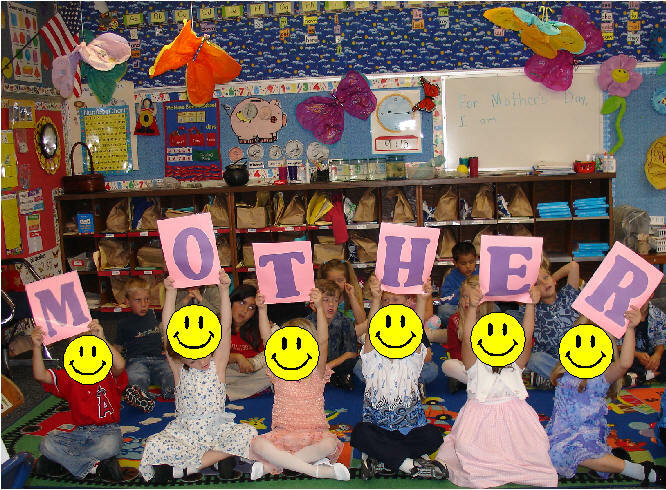 The children love performing and making this a very special day for moms. You can edit the script as you like to plan your own Mother's Day celebration. Lots of information is given to make this a fun day for all. 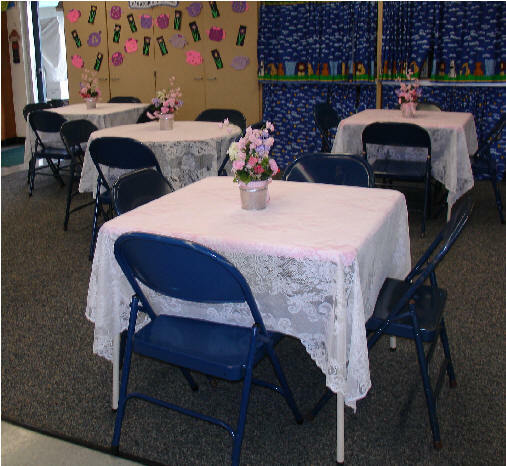 Ideas for refreshments, set-up, songs, poems, music, links, and lots of helpful hints are given to help you organize the tea. Mother's Day corsages are made with a Tootsie Roll Pop! 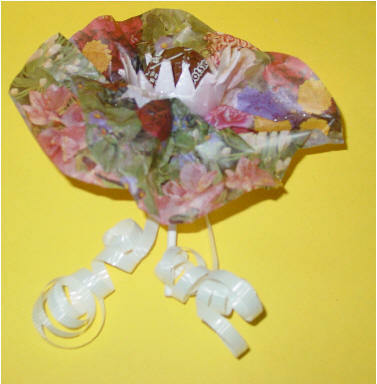 These are fun for Mother's to wear for any Mother's Day program or as a gift. 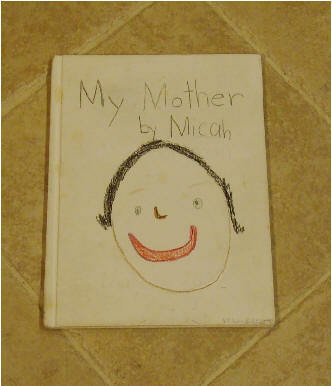 Each year we make a Mother's Day book as a gift. They have always been greatly appreciate by moms and a treasured gift! All of the pages are provided in a PDF to make these books. The above book was a purchased bound book, but you can print and collate this book to make with your students without purchasing the bound books. 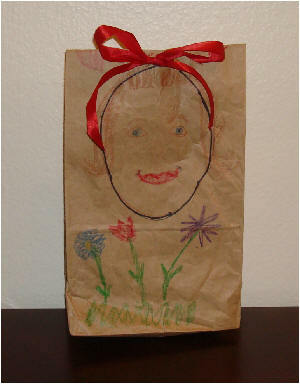 This is a great way for children to give their special gift that they have made for mom. Pattern and directions are given. 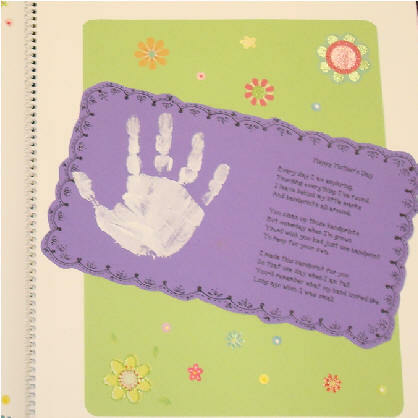 A great poem to use with handprints in scrapbooks. 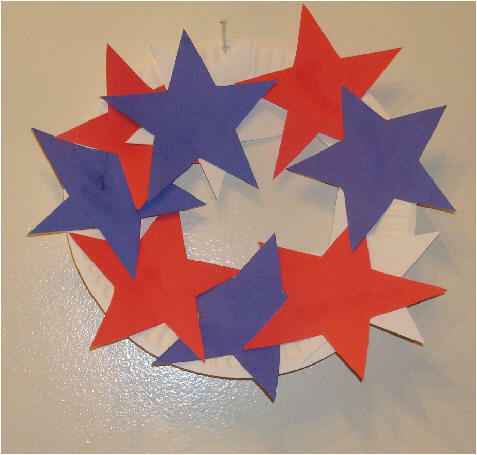 Celebrate Memorial Day with your students making a Memorial Day wreath. "My Favorite May Ideas" package with all of the ideas listed on this page is available for purchase for $15. I hope that these ideas will also become some of your favorites, too! After payment is made, an link will be provided for you to be able to instantly access the materials. If you would like to pay by check, please contact me. Receive a 10% discount for purchasing any two monthly packages! To view the activities for each of the months, click below. Please let me know on your Paypal payment which monthly packages you would like to order.